Has the job picture really improved? If you look at recently employment reports, you probably have the impression that the nation’s employment situation may have turned around. Last Friday, the government reported that January unemployment rate fell to 9.0% from the 9.4% in December 2010. Then this morning, figures from the Labor Department showed that weekly initial jobless claims decreased 36,000 from the previous weekly to 383,000, the lowest since July 2008. 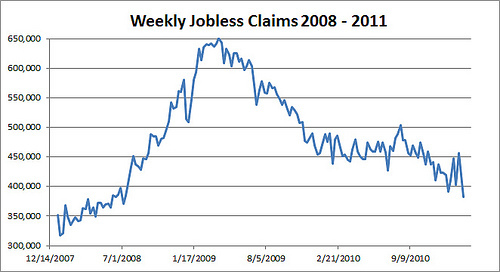 From the above chart, the overall trend of initial claims since peaking in early 2009 does seem encouraging. However, you may want to take the latest numbers with a grain of salt. The 9.0% unemployment rate, while a piece of good news for the administration, was likely a result of a smaller number of people actively seeking work instead of more hirings. And for the initial jobless claims, bad weather in a large part of the country last week could have played a big role in the reduction in claims. Until we see solid job creations, I guess we can’t really declare things have turned around.